When I saw the ad saying a Canon was for sale at such a price, I couldn't believe it. Just a few days ago, I read that the Canon PowerShot A540 had a safety issue and a major defect -- the camera would overheat, and battery life was extremely short. This was due to a spring that was long and angled vertically in such a way that it would cause a short circuit, which in turn would drain the battery and cause overheating. The price was too much had the unit been damaged indeed beyond repair, but since I knew I could fix it, I guess it was pretty cheap. Thinking about how much the camera originally cost makes me feel like a winner. I didn't spend much time deciding to make the purchase. 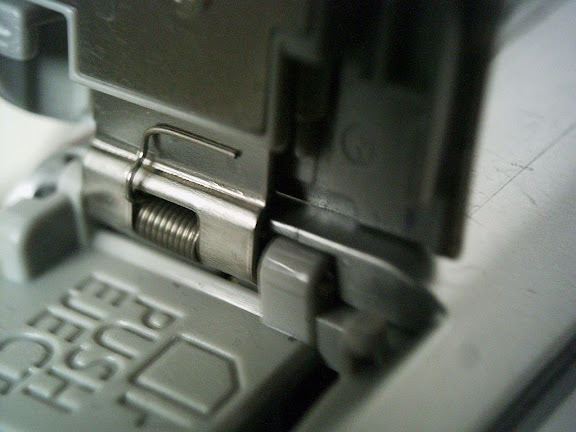 The first thing I did after taking the Canon PowerShot A540 into my hands was to open the lid and check the spring. I felt discouraged. It didn't resemble any of the pictures at the Canon Web site. The spring's left end looked like it had sneaked behind the metal plate on the lid; I don't know what's behind there, but I guess it did short the circuit. 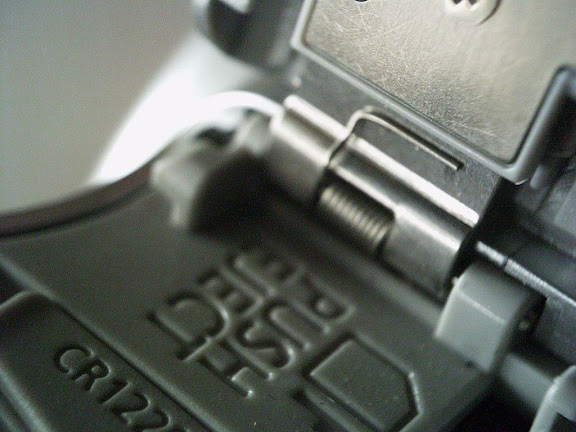 Anyway, I had to pluck it out of the metal plate with a pair of tweezers, carefully moving it to the left at about a 45-degree angle until I freed the end and it looked just like one of the photos in the Canon Web site safety advisory. It's the photo saying that the Opening/Closing spring sticks out. I took a pair of tweezers and a small long-nose (needle nose) pliers, held the lower part of the spring's left end (2 mm. 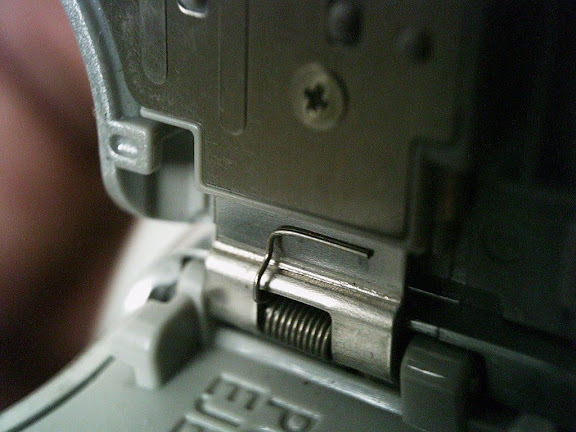 above the point where the spring wire exits its spiral) by the tweezers, and used the pliers to bend the spring at a right angle to the right, making sure it doesn't cross the plastic "divider." 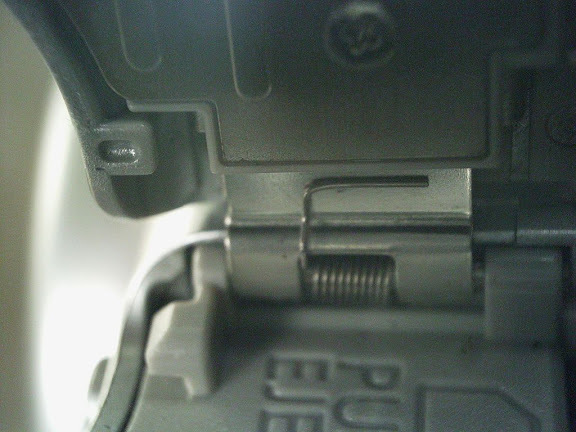 You don't want the spring to touch the metal plate that comes into contact with the batteries. If you can't make out the photos in the said advisory, check out these macro shots I made using a DIY lens taken from a junk Sony video camera and my tiny 3.1 megapixel Yakumo Mega-Image VII. The first owner of this PowerShot A540, the guy I had bought it from, had brought it on a number of occasions to the local Canon repair center, but the technicians couldn't fix the problem and insisted that the problem was with the battery and/or the charger. I think he brought the camera to the said center about three times, got fed up and finally gave up. He even said in his ad that he couldn't bear with the camera any longer, that's why he's letting it go. Dude, I'm really grateful that you're so busy with your programming work at Accenture that you don't have any more time to surf the 'Net. Otherwise, I wouldn't have this puppy in front of me right now. This is bliss.